I have a lot of things on my mind lately. So I found myself mindlessly crawling in traffic at 5:00 PM, not really stressing about the fact that we were only rolling at 20 miles per hour. You can take in a lot of scenery when traffic isn’t moving very fast and there’s one spot on my commute where Mt. Hood can be seen – if it isn’t socked in by grey clouds or so pale behind the haze of smog that a photo is impossible. Tonight I could see it was tinged pink. But would it stay pink long enough for me to get to the view point, get out of my car and shoot a photo? That’s always the iffy question. And did I want to stop considering how much time I was already losing in slow traffic? But, as I said, I have a lot on my mind. And stopping to smell the roses is a priority right now. You only live once: embrace the moment! It was still vibrant pink as I came to the exit, so I flipped on my blinker and escaped traffic. The woman in the blue car behind me did the same thing. It occurred to me that she might be one of those people who thinks it is clever to speed through the rest area and merge back into traffic six cars ahead of where they were. But she wasn’t: she stopped her car and got out, camera in hand. I guess pink mountains are irresistible. As I snapped half a dozen photos from different angles, I remembered a summer night in 1973. A warm summer night, unlike tonight when the frigid east wind was turning my ears into ice. We were hosts to a Japanese exchange student by the name of Keiko. Keiko was a little overwhelmed by the vastness of Nevada. And on this particular evening, as the sun set behind us, it turned the eastern mountains pink. In Nevada, you don’t think much about pink mountains. They just happen. But Keiko had never seen a mountain turn pink and she jumped for joy. Pure jot, clapping her hands together. “Pink! Pink! The mountain is PINK!” She cried over and over in delight. Tonight my heart was saying the same thing: Pink! Pink! The mountain is PINK! I lost a little ground in traffic, but it was well worth it. How often is the sky clear when the sun is at the right angle to turn Mt. Hood pink? And how often am I in the right place to see it happen? As my friend Jodi says, Life is Good. Beautiful! Glad you made it in time to get a good picture! What a gorgeous photo! I’ll bet it was even more glorious in person. Th one thing I miss about cameron moving from West Linn to Canby is her view. From her deck she could look across the OC Falls straight up to the mountain, just like your photo. I love that view. Pink, White or Brow, the mountain is a lovely lady no matter her gown. 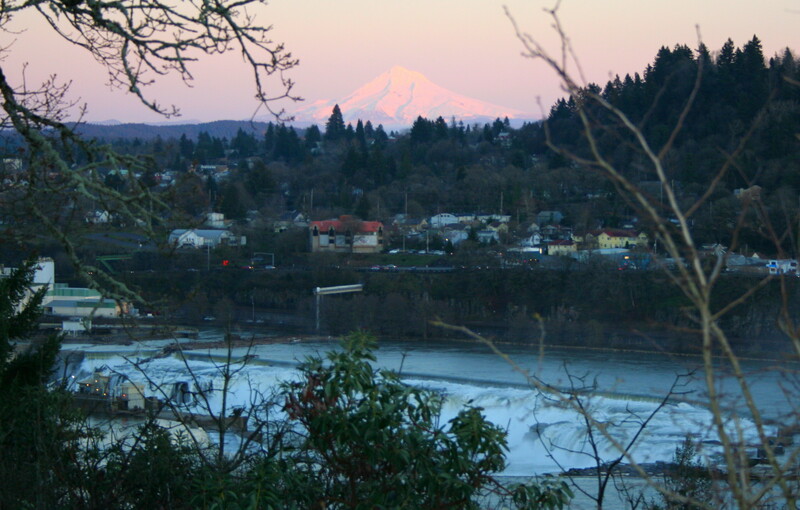 I like just about any view of the mountain from the hills of West Linn.